The almost 200 countries that signed the landmark agreement in Paris last year focused on curbing the sources of pollution by limiting fossil-fuel emissions. Trump’s environmental policies aren’t yet clear, though he has vowed to revive the coal industry and strip away regulations that make U.S. industry less competitive. During the campaign, he called climate change a hoax and pledged to withdraw from the Paris deal. This week, he told the New York Times he was looking at the issue closely with an “open mind” and said clean air and water are “vitally important.” That suggests the fight for a cleaner planet may need to shift toward tackling the pollution itself. Eighty percent of cities around the world that monitor air quality failed to meet standards set by the World Health Organization last year. London surpassed the European Union’s annual limits on air pollution just eight days into 2016. There are plenty of technologies that filter indoor environments such as offices and shopping malls. Whether it will really be possible to engineer clean air on a large scale outdoors in urban areas is still in question, with answers only hinted at by early-stage demonstration projects. If these ideas are commercialized and mass-produced, emissions from manufacturing the devices would also have to considered. And if they’re actually able to work at scale, the disposal of airborne junk may be another hurdle in the future. 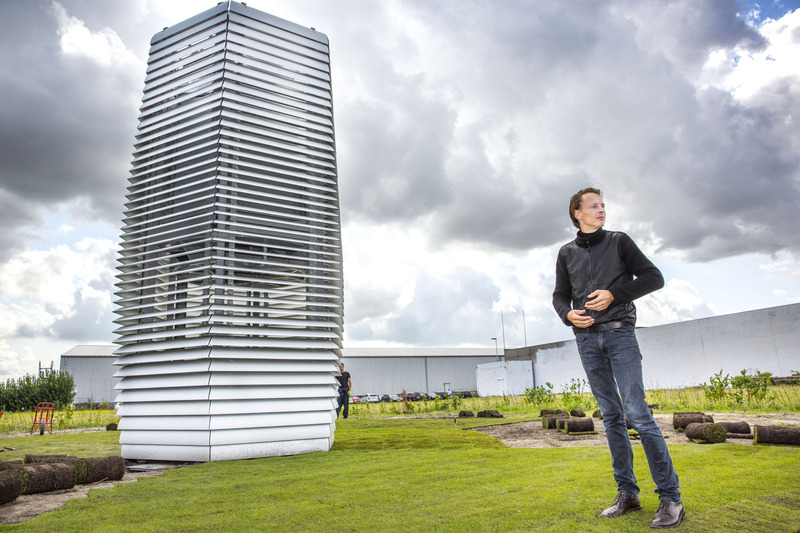 Studio Roosegaarde in Rotterdam says the end product from its own device is too toxic to put into landfills, though the founder says he may have a solution. The firm has created a giant air purifier, known as the Smog Free Tower, that cleans an area the size of a football stadium. The machine uses a method known as “ionization,” with static electricity, sending out a positive charge to attract particles to its negatively-charge surface. Then it compresses airborne pollutants to a black dust. His studio stores the concentrated smog in plastic casings that’s turned into jewelry. A ring topped by a tiny black cube was previously about 1,000 cubic meters of dirty air. He’s working on a new design that would integrate his machine into a city’s sewage pipes so the toxic dust would be processed with the waste water, easing the disposal problem. The company has partnered with the Chinese government, taking part in its $172-million war on smog. Roosegaarde is traveling through the Asian nation to present his machine in Chinese cities, beginning with Beijing. China, which has built thousands of coal plants to power its economic growth, accounts for about a quarter of the planet’s pollution. A study from Berkeley Earth showed that air pollution kills 4,000 people per day across the country. Elegant Embellishments in Berlin is also looking to start working in China. The industrial design studio has created a material for building facades that reacts chemically with harmful particles in the air and neutralizes them. The surface is made from titanium dioxide, a common ingredient in paint and paper for its white pigment. It turns pollutants such as nitrogen oxide and volatile organic compounds from vehicle exhaust pipes into calcium nitrate, a type of salt, and a little bit of carbon dioxide. The salt collects on the facade and gets washed away when it rains. Elegant Embellishments’ first project was a hospital in Mexico City in 2013. The facade neutralizes harmful particles equivalent to 1,000 cars driving in the city every day, according to co-founder Daniel Schwaag. The studio is currently setting up a new company that will be working in the Chinese market.